Dana Awartani’s sand piece, I went away and forgot you. A while ago I remembered. I remembered I’d forgotten you. I was dreaming (2017), mimicks traditional Islamic tiles. The fourth edition of Shubbak, the biennial London festival that celebrates Arab art and culture, starts this weekend. The two-week-long festival (1 to 16 July) includes more than 150 artists from 14 Arab countries at over 80 events showing visual art, performance, film and literature. This year’s offerings will focus on “looking imaginatively to the future, whilst reflecting on the fragility, resilience and challenges of artists in times of crisis,” a press statement says. The visual arts programme kicks off at the British Museum with a day of talks and performances, dedicated to how Middle Eastern artists and organisations can survive in the face political conflict, censorship and cultural destruction. “The British Museum is an ideal location and partner to explore the multiple issues of preserving cultural heritage and the fragile situation of artists,” says Eckhard Thiemann, the artistic director of Shubbak. 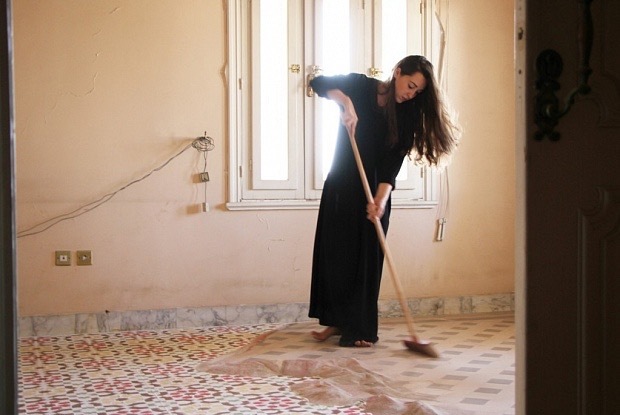 A day-long symposium on Sunday, 2 July, organised by the Mosaic Rooms and Shubbak, will include contributions from the artists Sofiane and Selma Ouissi, Larissa Sansour and Khaled Jarrer as well as presentations by important organisations from the region such as the Atassi Foundation, Al Mawred Al Thaqafy, the Ruya Foundation, and Cairo’s Townhouse Gallery. 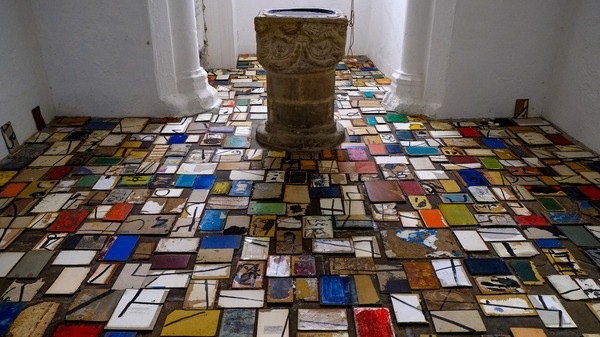 Issam Kourbaj, Unearthed (In Memoriam) (2014) at St Peter’s Church, Cambridge, part of his solo show at Kettle’s Yard. Courtesy of the artist. Photo: Sir Cam © University of Cambridge. The museum’s Great Court will also be taken over by performances and site-specific works that look at the important role of artists and museums in preserving memories of the past. 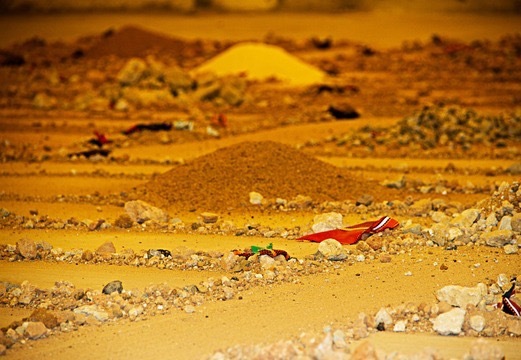 The Saudi Arabian artist Zahrah Al-Ghamdi will create an intricate floor installation made of sand and found objects that she has collected from abandoned villages in her home country. Another installation by the Syrian artist Issam Kourbaj will cover 60 sq m of the courtyard floor in hundreds of old hardback books, some painted with a black line to evoke the Syrian tradition of placing black ribbons over the photographs of people who have died. A conversation between Kourbaj and the curator Venetia Porter will also explore the histories behind the museum’s exhibition of recently acquired works on paper by Middle Eastern artists. The work of female artists from the Middle East features in three exhibitions. Gasworks in Vauxhall is presenting a solo show of film, sculptures and photographs by the Kuwaiti artist Monira Al Qadiri, which reimagines international diplomacy as an alien conspiracy. The Syrian artist Sulafa Hijazi will show a series of animated images at Rich Mix in east London, in response to society’s growing use of social media and 24-hour news. Works by three young Saudi Arabian female artists, which look at living and working in a country of rapid social change, will go on show at the Mosaic Rooms in Kensington (1 July to 2 September). Zahrah Al-Ghamdi, Inanimate Village. Courtesy of the artist. Shubbak is London’s largest biennial festival of contemporary Arab culture, bringing new and unexpected voices alongside established artists to audiences in London this summer. By Aimee Dawson, Reprint from The Art Newspaper, 30 June 2017, © 2017 The Art Newspaper.